While many people look at gourds and see a funny looking fruit, Priscilla Wilson sees a work of art. Since 1976, she has been turning all shapes and sizes of gourds into decorative containers painted with flowers, rolling toys for toddlers, holiday ornaments, masks, and a mind-boggling assortment of other artistic creations. You’ll find all these and more at The Gourd Place in Sautee Nacoochee, Georgia, just minutes from Lucille’s Mountaintop Inn & Spa. The business, which is the oldest gourd-crafting business in the United States, grew over the years as Priscilla experimented with artistic styles and creating more works with ties to nature. 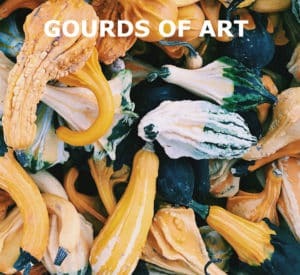 Then in the year 2000, Priscilla and her partner Janice Lymburner developed a unique method of using gourds as pottery molds. The result was a whole new line of work, called Gourd Impressions pottery. The collection of dinner plates and bowls has the veins and texture of a gourd, and shapes that vary with the slight warping that can occur during firing. Best of all they are all microwave/oven/dishwasher safe. 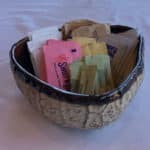 You’ll see several examples of the company’s work here at Lucille’s, including the sugar bowl we use every day. Stop by The Gourd Place to see a selection of Pricilla’s work, including her gourd designs, patented gourd stoneware, natural materials jewelry, gourd-inspired notecards, and textiles printed with wildflower designs. If you’re looking for one-of-a-kind gifts, this is a terrific place to shop. Be sure to visit the on-site museum too, which is free. The permanent collection here includes gourd designs from 23 countries, as well as reproductions of early American items and works by contemporary gourd artists. Sautee Nacoochee is home to a delightful group of artists and talented townsfolk. Now’s a wonderful time to visit them—and us! We’ll look forward to seeing you. This entry was posted in Art, Georgia Mountains, Shopping and tagged Georgia Mountains, Mountain Crafts, Shopping by admin. Bookmark the permalink.